BEIJING -- Last week I wrote about "Red China Blues" (Doubleday, 1996) by Chinese-Canadian journalist Jan Wong. 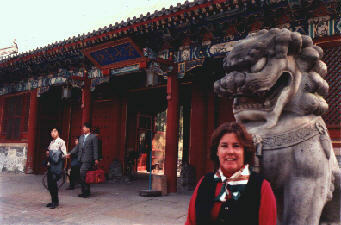 Wong came to this campus, Peking University, in 1972, at the height of the Cultural Revolution, and spent several years trying to remake her bourgeois soul into something more politically correct. Finally, she along with the rest of the nation gave it up. The abrupt end of the Cultural Revolution left Wong determined not to be fooled again. You might say she over-compensated -- she became a journalist. She returned to China in time to witness the events that took place in June 1989 at Tiananmen Square. When I was invited to speak at an advanced English class at Beida (the nickname for Peking University), I made copies of my "Red China Blues" column, which I thought would be of great interest to the students since much of its action takes place right here. My American host at Beida warned me that the students might not be eager to talk about numbers of people killed at Tiananmen especially because, while the official government estimate is about 300, Wong sets the death toll at closer to 3,000. "The subject is taboo," he said. Just to be on the safe side, I gave an advance copy of the article to the American teacher of the class, told him what it was about, and asked him to read it. He didn't read it. "There won't be any problem," he said. So I handed out copies to the class, read it out loud, and invited comments. The previously friendly atmosphere in the class grew noticeably cooler as the students digested the critical comments made by Wong, repeated by their guest lecturer. "I was here in 1989," said one older male graduate student, speaking in English, "and I still don't know who was right and who was wrong." "How does she know that 3,000 were killed?" asked another female student. "The Chinese Red Cross estimated nearly that many," I said. "Why call it the Tiananmen massacre?" Other journalists refer to it as the Tiananmen pro-democracy demonstrations. "This was her feeling," I said. "She was a reporter and watched it from the balcony of the Beijing Hotel." "Why does she call New World Mao (Mao Zedong's grandson) a couch potato?" complained the same woman. "Why does she pick on him for being fat?" I wrote "irony" on the blackboard. "Why does she write about the Stalinist period in Chinese history," the defensive woman continued. "China has a long and glorious history, why just this period?" I wrote "memoir" on the blackboard. "How does she know that China leads the world in per capita executions?" Other students continue defending Mao's grandson. "He wrote a history book," an older student said. "And his father died in the Korean War." It's clear the class is insulted and I feel bad. "Look," I say, feeling desperate. "Wong lived in China for a total of 12 years -- six years the first time, six years the second time. She wouldn't have spent any time here at all if she didn't love this country." My time is up, the presentation is over. The American teacher, left with a hornet's nest on his hands, nonetheless graciously asks the class to thank me and I get a polite round of applause as I hastily retreat. I didn't want to insult the class, I just wanted a lively discussion. I rode my bike back to the campus guest house, thinking the incident was over. But it wasn't. The next day my American host received a two-hour interrogation from campus officials who'd heard about the talk. "All guest lectures have to be approved in advance," they said. This is a rule, like so many Chinese rules, written in invisible ink. None of the foreign teachers had heard of it before. A meeting of all English teachers will take place to make sure this never happens again. A small incident perhaps. No one was fined, imprisoned or beaten. But I heard about another incident that made me very nervous. An American student from UC Berkeley studying in Beijing had his front pocket picked and his wallet stolen. When he complained to a police officer and asked for help retrieving the wallet, he was fined a hefty amount on the spot. Why? Because the student had unwittingly slandered the entire Chinese nation by suggesting a Chinese person had stolen his wallet. I got off lightly.